A Fine Gael parliamentary party meeting has heard calls for Public Expenditure and Reform secretary general Robert Watt to be sacked. 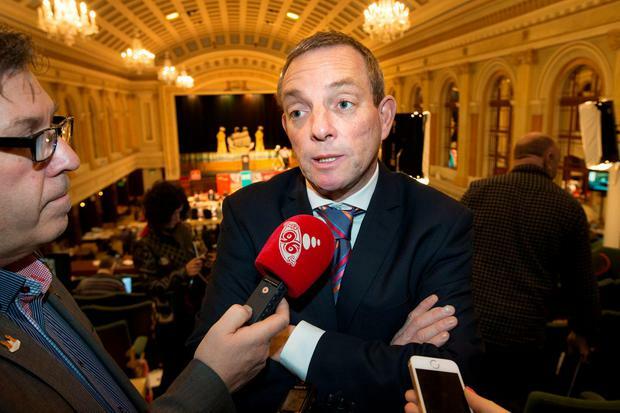 Fine Gael senator Jerry Buttimer told the meeting Mr Watt should be sacked for suggesting people who hold free bus passes should be banned from using public transport during rush hour. Mr Watt said pensioners were getting on buses and trains for free during peak hours while “mortgage slaves” had to pay full price on their way to work. Speaking at the Fine Gael meeting tonight, Mr Buttimer said Minister for Finance Paschal Donohoe should immediately sack Mr Watt for the comments that have been met with intense backlash in political circles. It is understood finance minister Paschal Donohoe defended Mr Watt paying tribute to the service he has given to the State. But Mr Donohoe moved to reassure his colleagues, making it clear that it would be the government that would decide on such issues not civil servants. Meanwhile, Minister for Transport Shane Ross said the Independent Alliance will “staunchly resist” any proposed changes to the Free Travel Scheme was suggested by Mr Watt. “The intervention of a top civil servant into a politically charged area is hugely unusual. As long as I remain Minister for Transport, I will not countenance any reduction in the availability of free transport to senior citizens,” Mr Ross said. The Independent Alliance backed statement added that the free travel scheme has been an “extremely positive initiative” for many elderly and vulnerable people. “It has been suggested by the Secretary General of the Department of Public Expenditure and Reform that those with Free Travel Passes could be forbidden from using their passes on public transport during peak commuter periods. “This would place many under severe hardship – those people who rely on public transport to make it to hospital appointments, day patient centres, activities and visiting family. “As it stands, many holders of the Free Travel Pass avoid using public transport during peak times due to the busy nature of the services. But there are other occasions where they simply have no choice but to travel early in the morning or during the evening rush-hour period. “Outside of our cities, the Free Travel Pass has been central to combating rural isolation. “The Independent Alliance will not stand by and tolerate a regressive change to what is a very successful and popular scheme,” the statement added.